When I arrived at Ivy’s house, our construction supervisor Dave Landis was setting up for the task at ha nd. We were going to take the top siding boards off the outside walls and blow recycled and treated cellulose (paper) insulation into the wall cavities, then add 9 inches of the same in her attic. 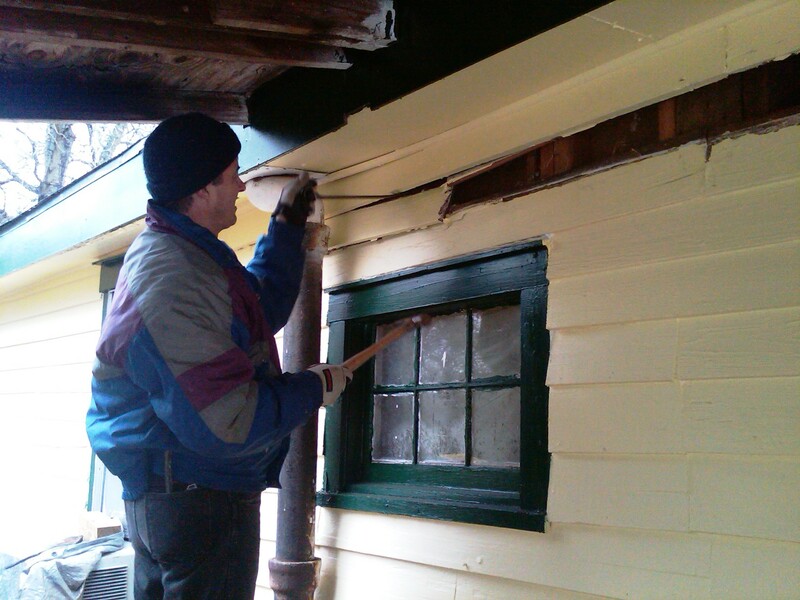 This was our first attempt at weatherizing walls of an older house and we were a bit nervous. But Allen Slabaugh and Alyssa Hostetler arrived to drop off the college students from South Georgia Tech’s Phi Beta Lambda chapter. Then they went on to Koinonia to work with a second crew on Nashua Chantal’s house, a renovation of one of the original Partnership Housing units located in Forest Village. 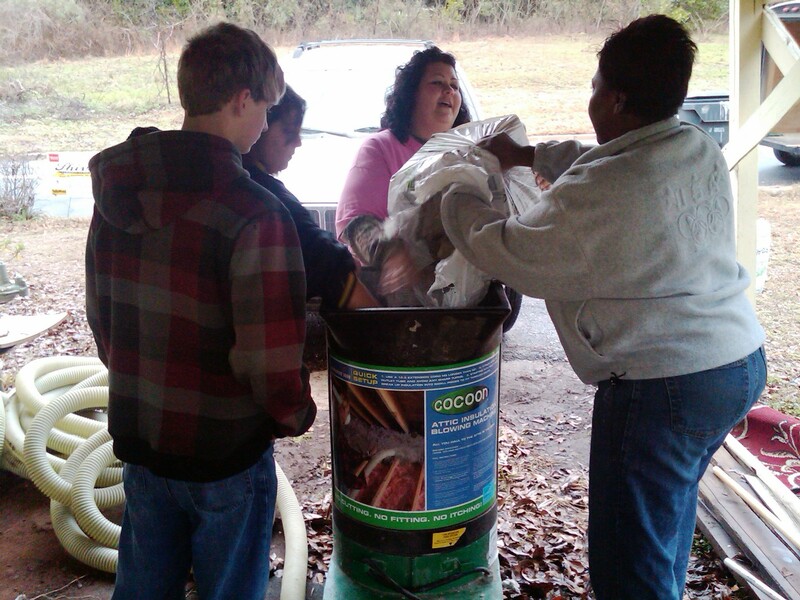 As they drove off, another volunteer showed up… Thaddeus Harris! Thad is our homeowner from the recently completed Elizabeth Street duplex which was a “Gold” rated Energy Star house. Thad wasn’t here to earn his required sweat equity hours. Thad had more than met his reqirement of 500 hours and logged more hours than any homeowner I have ever worked with over the past 23 years. Thad was here because he loves volunteering with us. 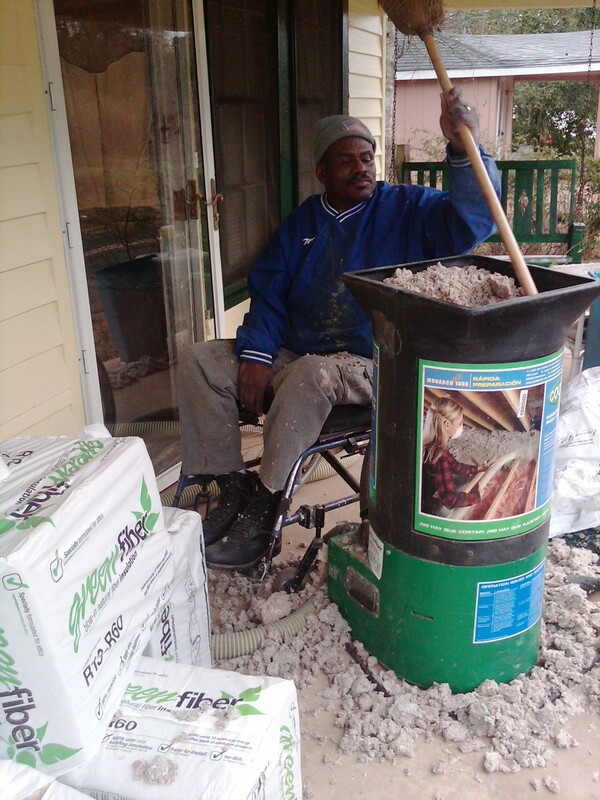 He told me he wants other folks with disabilities to see that they don’t have to give up. By his witness, they can see that they too can have a fulfilling life. And nothing is more fulfilling to Thad than working on Fuller Center projects! The rain let up and the ground was amazingly still hard enough for Thad to wheel around Ivy’s yard. The South Georgia Tech students blew the insulation as high as they could and Thad went to work cutting pieces of bat insulation to fill the top where the board was removed. All was going very, very smoothly. I called one of our most faithful volunteers, Dr. Wallace Mays, who serves on our board of directors of The Americus-Sumter Fuller Center. I said, “Doc, if you’re out running errands, come by Ivy’s house. I think the methods we are using today can help a lot of people living in older houses.” He came right over and loved the concept and the cost of what we were doing. 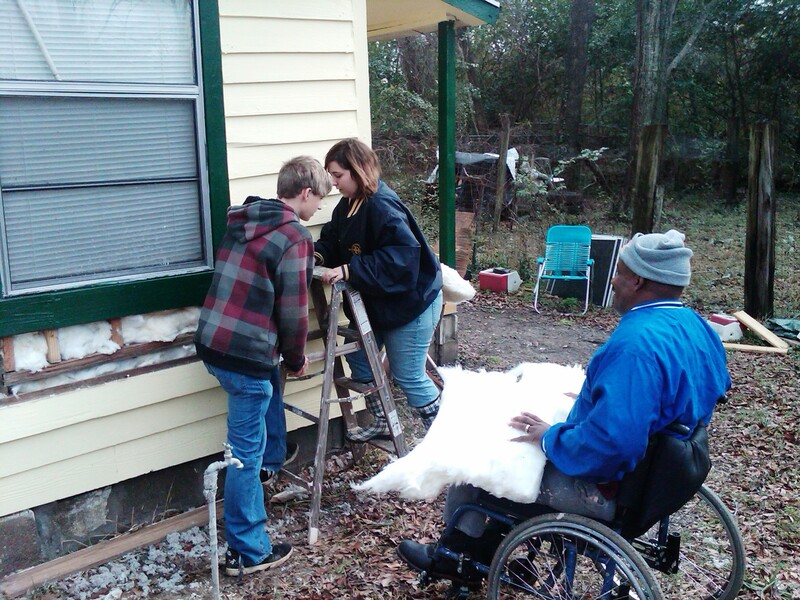 All of the materials needed to insulate the walls and attic and replace the siding boards on Ivy’s 1,000 square foot house totaled up to just $500! 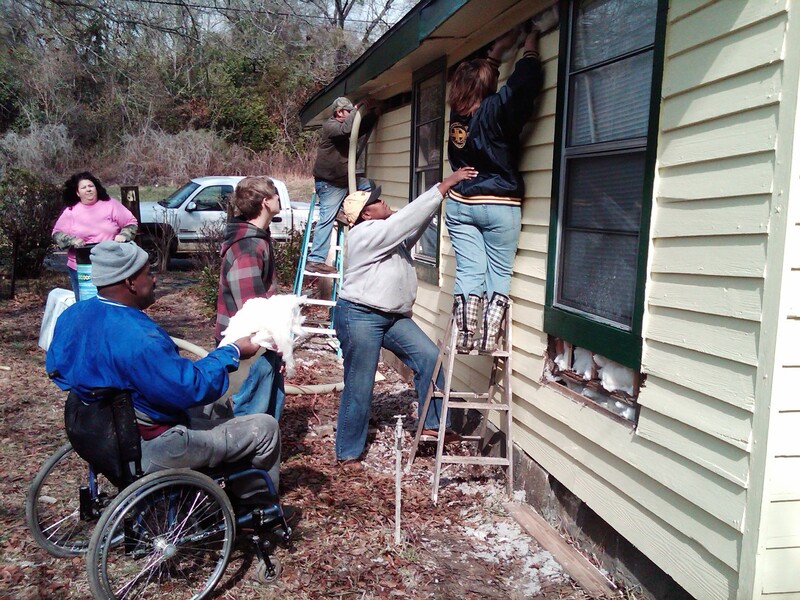 I said, "Doc, even a small church can sponsor this type of project and make a big difference for some folks in need." Soon it was lunch time and the students had to leave. I became concerned that it was only going to be Dave, Thad, Ivy and myself left to insulate the attic. We were going to be short some help. I went off to get some supplies and my anxiety started to build. A construction site is a lot like a theatrical play. I’m not talking about the drama, although from time to time there is drama. I’ve observed that on a construction site, different actors come on stage at different times to help move toward the conclusion. Each one does a small part and collectively they tell a complete story. Millard said “Every house is a sermon of God’s love.” My kind of story. We went back to work. Doing a repetitive, manual task often gives workers time to visit so Thad and I began to talk while we worked. I asked him what his January electric bill was. He told me, "About $86." I quickly calculated, “That’s just $2.75 per day for heat during the coldest month of the year.” The energy-efficient strategies we used on Thad’s new house were paying off. I told him that I had heard that he and is neighbor Chuck, who is also confined to a wheel chair, were given remote-controlled fans that were programmed to the same frequency. “You heard about that?” He laughed. "Can you imagine me and my wife arguing about who turned on the light and the fan when it was our neighbor Chuck pressing his remote? She asked me why I turned it on when she had just turned it off! We had a good laugh and I reassured him that the frequency on the remotes could be reset so they wouldn’t be annoying each other. I told Thad that we were planning a conference celebrating Clarence Jordan’s 100th birthday in September, 2012. I asked him what it was like growing up in Americus. What did the people think about Koinonia? He told me that he was one of the children who got to go to summer camp at Koinonia. He remembered being fed lunch, upstairs at the Habitat office, every Tuesday and Thursday by Will Archibald and Millard’s former law partner, Tom McFarland. He said some people were very angry that his mom was involved in civil rights so he was attacked and forced to lie down on a fire ant hill in an attempt to intimidate his mom and stop her involvement in the struggle. I started off the day thinking we were there to minister to Ivy and her daughter. It turns out that I was the one who received the most ministering today. The Kingdom of God is at hand. Thad’s house is our house. Ivy’s house is our house. This is the blessing you too will receive if you volunteer on a Fuller Center project. Won’t you join us?